What’s Going On Inside the Frame? 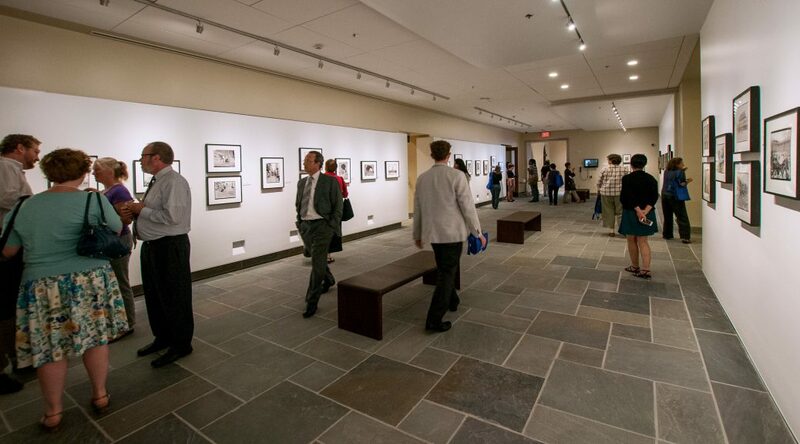 As part of the Rubenstein Library Renovation Project a few years ago, the Special Collections Hallway Gallery was enlarged and rebranded as the Rubenstein Photography Gallery. The 67′ by 25′ space features a different collection from the Archive of Documentary Arts every few months. Because it still functions as a primary route through the building, the gallery provides an inviting environment for visitors to experience the library’s photographic collections. 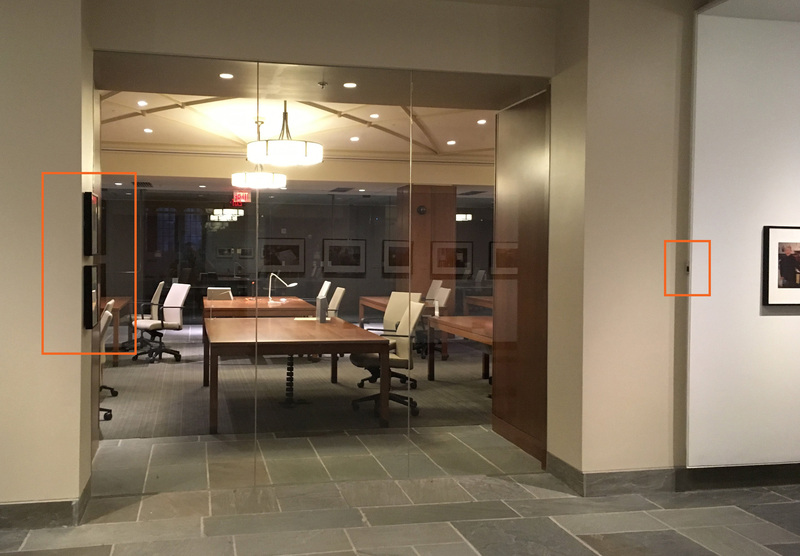 We have been monitoring the environmental conditions within the space continually since it reopened in 2015. Although the temperature stays very stable in the building throughout the year, we do see some fluctuation in the relative humidity (RH) for the gallery. In the coldest winter months, public spaces tend to become very dry because of the heating systems. The question has been lingering in our minds: what are the environmental conditions that the artwork is experiencing inside the frame? 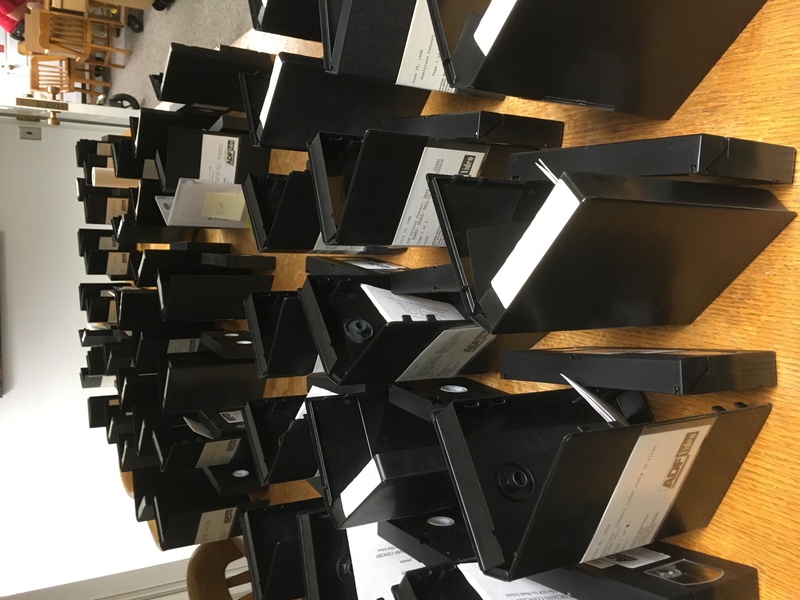 Last fall, a small working group from Conservation, Exhibitions, Preservation, and the Archive of Documentary Arts gathered to design a simple experiment to try and answer this question. 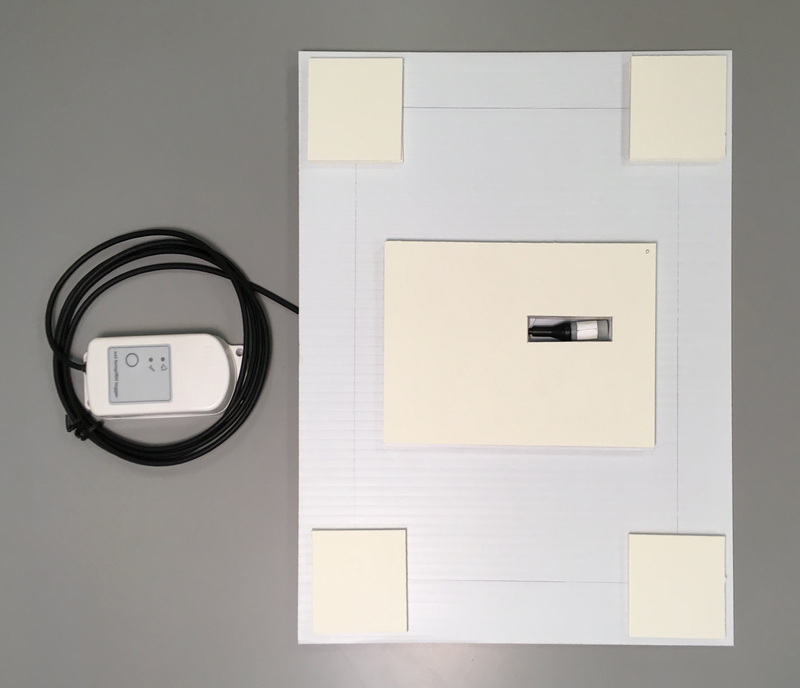 As part of this experiment, we wanted to not only measure the temperature and RH within our normal frames, but see if there was something simple we could do to buffer any changes to those conditions. 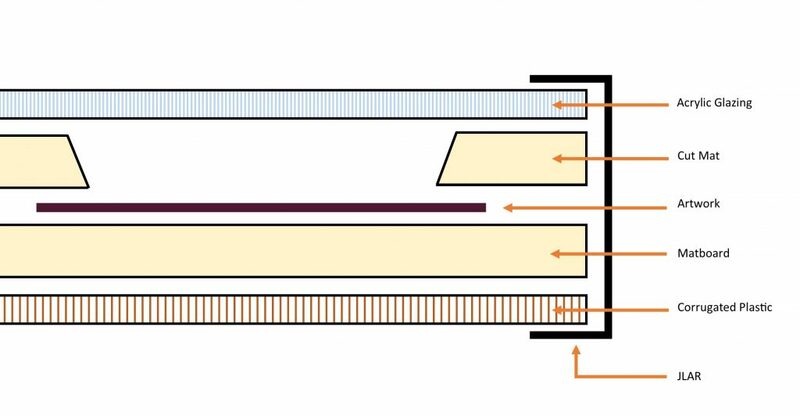 While there are many options available to change the conditions inside a frame, we determined the easiest (and cheapest) option would be to seal frame contents in a relatively impermeable package. Framed photographs in our galleries include several components inside each frame. The glazing of our frames is a UV-filtering acrylic. Beneath that is a window mat cut to the size of the artwork. The print is mounted to another piece of mat board underneath. At the back of the package is a piece of corrugated board made of white plastic (polypropylene). We hypothesized that by taping the outside edges of this “package” of material with polypropylene tape that the air exchange inside the frame could be significantly reduced and therefore reduce the change in RH. We decided to set up two identical frames for comparison, one with a sealed package and one without. 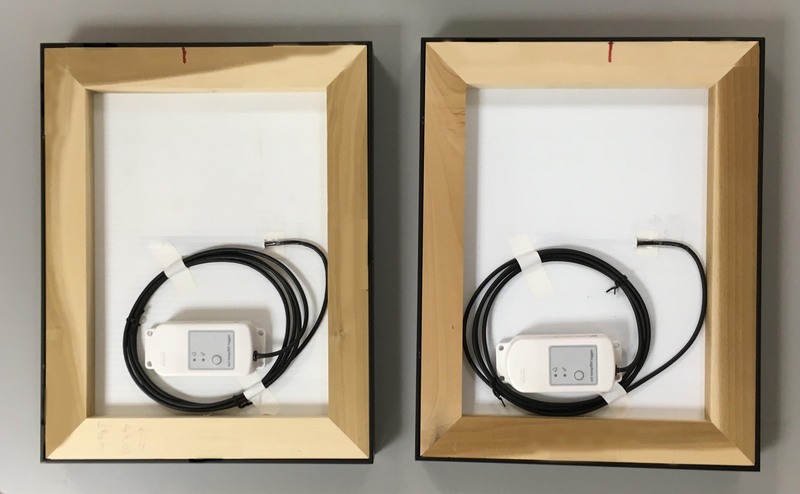 We acquired two HOBO MX2300 Temp/RH dataloggers with external sensors and I set to work fitting them into two of our standard gallery frames. We have a lot of small scrap pieces already and I didn’t want to waste materials. Frame packages typically only have one full mat board sheet and window mat inside. Adding five or more full sheets to the package seemed like a lot of additional material, which might act as added RH buffer. The rate of change between the two frames was the important variable. As long as each package was constructed with the same quantity of material inside, we should be able to get a representative comparison. An inkjet print with a cut mat and the glazing was placed on top of the sensor. The sensor cable was passed through a hole cut in the corrugated plastic, allowing me to mount the logger to the back of the frame. The contents were all stored in a stable 45% RH environment for several weeks before installation. With the package all together, I sealed up the outer edges as well as the hole in the plastic backing with clear tape. The sealed package was then placed inside the metal and wood frames. Back of the frames, with data loggers mounted. We installed our sealed and unsealed experiment frames in the gallery in early December 2017, along with a new show. 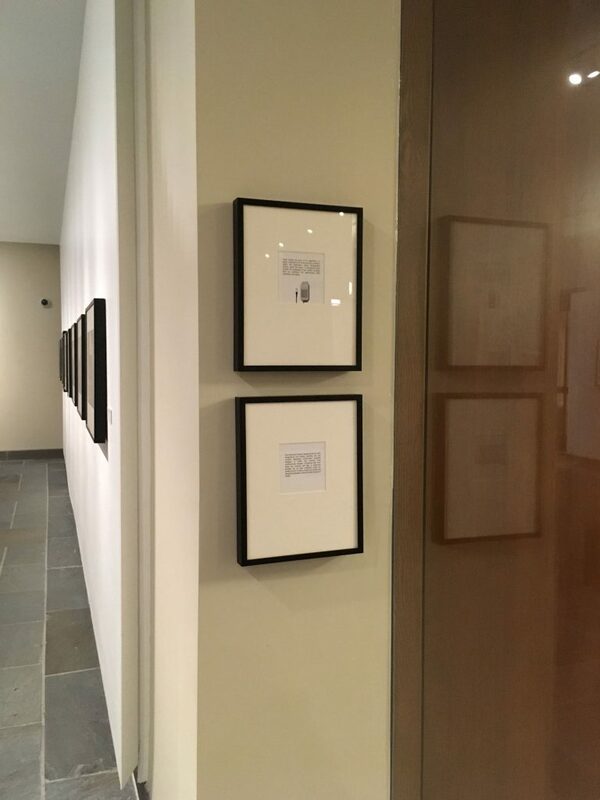 The frames were mounted on a small wall, next to the window to our reading room, so as to be less of a distraction from the rest of the exhibit and to be in close proximity to the data logger which monitors the gallery space. Experimental frames (left) hung inside the alcove, across from the data logger (right). The inkjet prints we included in each frame had a short description of the experiment so that curious patrons would understand the the purpose of their unusual positioning. After five months, we took the frames down and compiled all the environmental data. 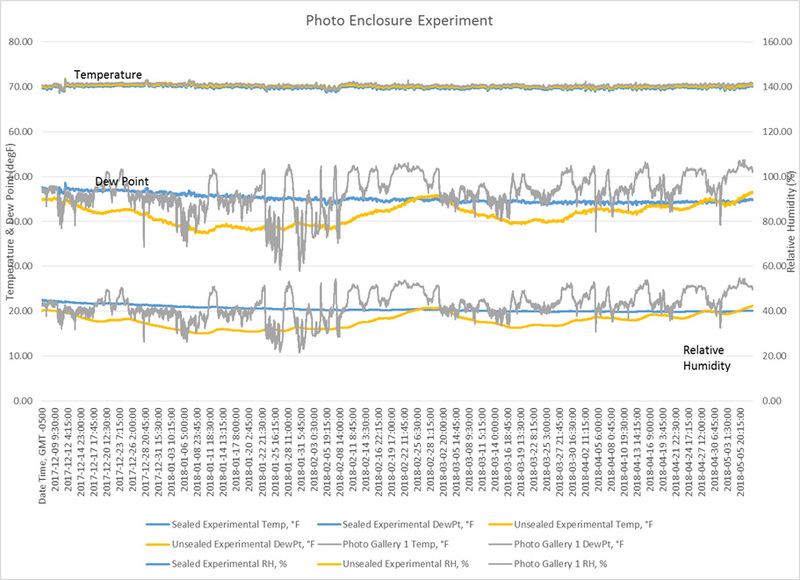 In the graph below, the gallery conditions are marked in grey, the unsealed frame is marked in yellow, and the sealed frame is marked in blue. Temperature values are displayed on the left, while RH values are displayed on the right. The data confirms that the space maintains temperature very well, staying right around 70 degrees Fahrenheit. The RH in the gallery space does bounce around quite a bit throughout the winter months, fluctuating between around 50% and 20%. Late January 2018 seems to have been particularly volatile. We were very surprised at how well each frame responded to the conditions in the gallery. 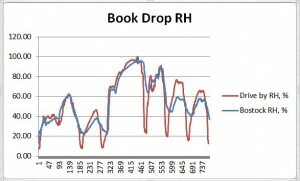 Even inside the unsealed frame, we see a significant smoothing out of the RH graph: the over 30 point spread of the gallery RH is reduced to around 12% change in the unsealed frame and the contents did not drop below 30% RH. The sealed frame package performed very well, with only about 6% overall RH change in 5 months. While the methodology of this experiment does have flaws, it is an inexpensive and adaptable approach to measuring environmental conditions. We can be reassured that our normal framing practices protect prints from drastic changes, even in the most volatile months. We can also take the relatively simple and cost-effective step of sealing the frame package to provide additional protection for more sensitive materials. This experiment has raised questions of how other methods, such as sealing the frame package differently or adding pre-conditioned board, might compare. It is likely that our investigations will continue, so that we can make the best choices for our collections. 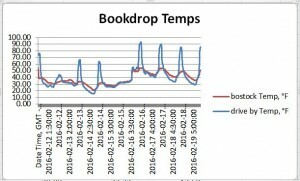 How Hot Is Your Book Drop? We have two external book drops available to library patrons. The “Bostock” book drop is an aluminum box that sits under an archway between our two library buildings. It is somewhat protected from the elements by being under a stone archway and nestled against the library building. The “Drive By” book drop is a powder-coated steel box located at the back of the library near the parking lot. It sits in a sunny spot and is exposed to the elements. 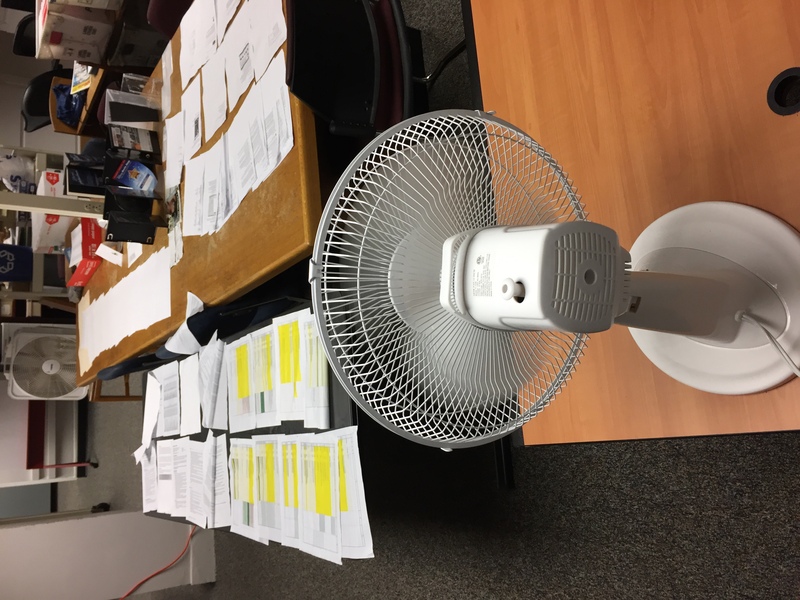 Last fall, a coworker in Circulation came to me with his concerns about the conditions of the books he retrieved from the external book drops. He said they often felt damp and even warm. I thought it would be interesting to put a HOBO datalogger in each of our external book drops to see what was happening inside. Last August we put one HOBO in the Drive By book drop for a short test. I knew it was likely to be hot and humid in that box. 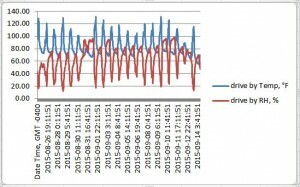 I was eager to see the actual data. My advice? If you aren’t prepared for the truth, do not seek it. At its hottest, the Drive By box reached 131 degrees Fahrenheit. At its most humid it reached 99% rH. That test brought up a lot of questions. Since we were moving into the cooler and drier fall and winter seasons, we decided to do a longer test during the spring semester. 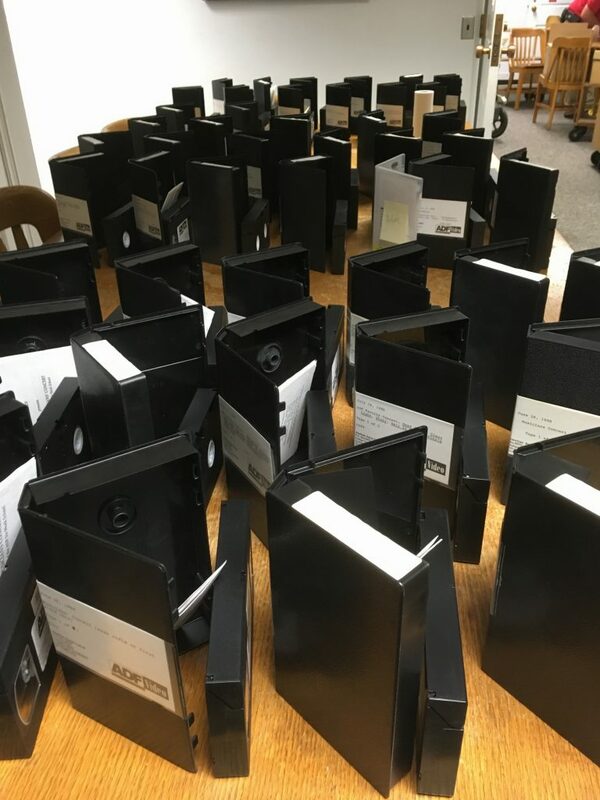 This January, we put a HOBO in each of the external book drops and set them to record at the same time and interval rate so we could compare them to each other. This afternoon I downloaded the data for the past week. This week was a typical North Carolina winter week. We had low temps in the 30F’s and high temps close to 60F. There were rainy days and sunny days. Environmental readings in both book drops from Feb. 11 to Feb. 19, 2016. You can see that even in winter that steel box gets quite warm on sunny days. The humidity levels range from very wet to very arid. The aluminum box has its extremes, but they don’t spike as high as the steel box. It’s interesting to think about how the different metals, and the different locations, may be effecting the interior conditions. I do not expect external book drops to have perfect preservation environments. I am, however, concerned about the extremes these environments present. I’m sharing this data with the Head of Access and Delivery Services so we can figure out what, if anything, we should recommend to the library in terms of these boxes. I really love these HOBOs. They are easy to use and reasonably priced, and the data can be easily downloaded in a variety of ways. Henry wrote a review of these HOBOs recently if you are interested in learning more about them. 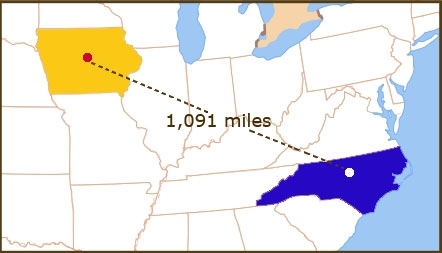 1091 Project: Whither the Weather? Today on the 1091 Project we bring you a weather reminder. Over the past several weeks we have had so much rain that we are out of a drought for the first time in three years. That’s a lot of rain. It didn’t come without a hitch. You get to know your building pretty well and when it starts to rain you check the usual problem areas. 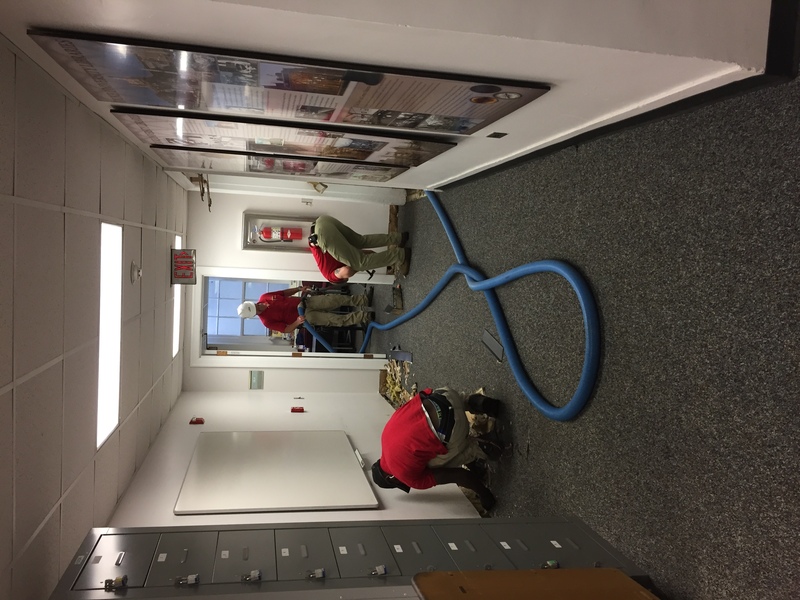 During our recent downpours we had a few drips in the lab resulting, we think, from a clogged roof drain on the second floor. Of course, a few weeks ago a roof hatch was open when it rained, causing a leak on an upper floor. Rain is just one element that we watch carefully. 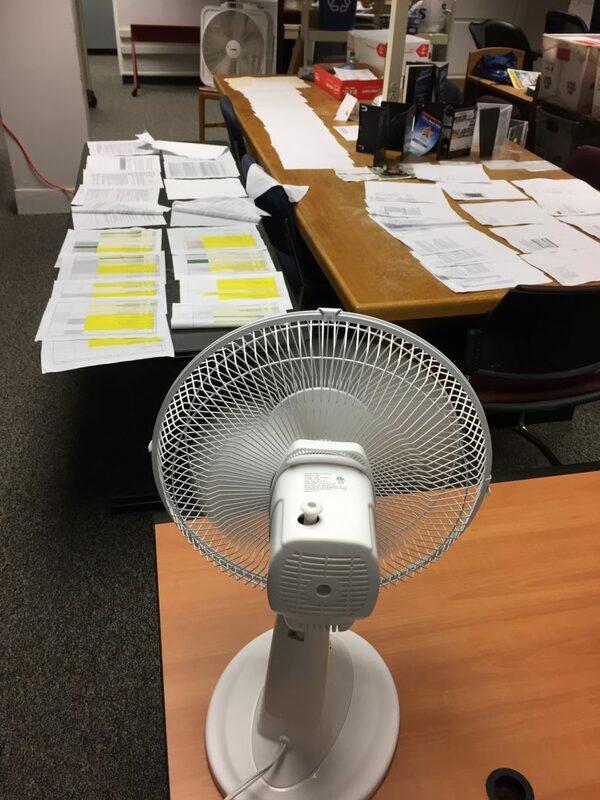 When the humidity levels are high in the summer or very low in winter, the air pulled into the HVAC system can affect the conditions in the stacks. 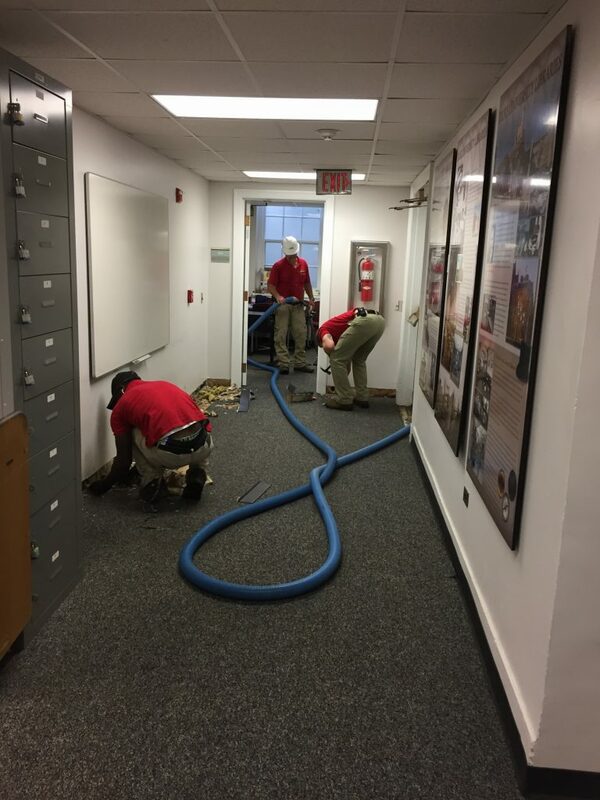 We try to work with our Facilities department to mitigate the swings as much as possible within the system capabilities. Sun and wind are issues to keep an eye out for as well. We installed window shades in our exhibit space to reduce the sunlight entering the gallery. And this time of year we keep watch on hurricanes that come up the North Carolina coast that have the potential to drift inland bringing rain and damaging winds. The Duke Marine Lab Library on the eastern coast is especially vulnerable during hurricane season since it sits on a barrier island. 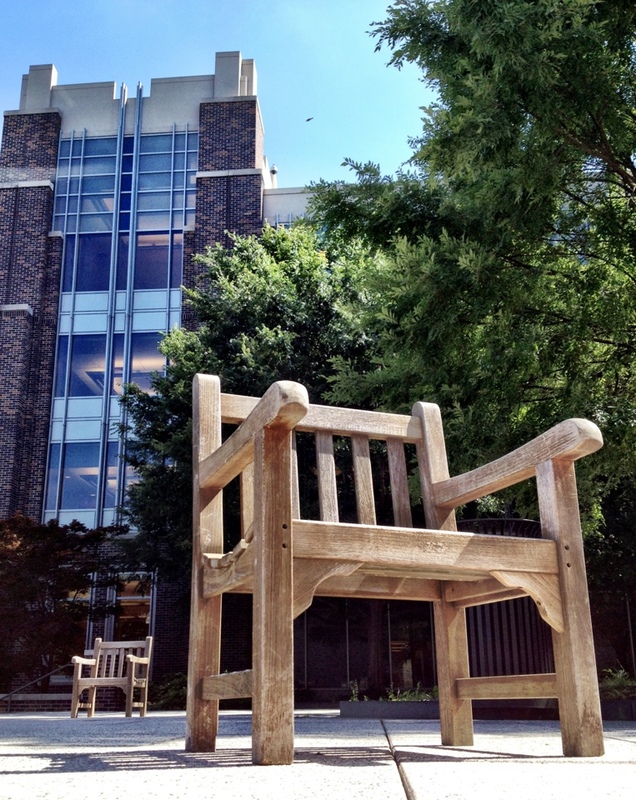 A beautiful early summer day on the patio between Perkins and Bostock libraries. Of course, on a day as lovely as today you don’t think much about the problems the weather can cause for the library. Not that I’m complaining, but it is hard to return to the basement after your coffee break outside on such a glorious day. Let’s travel west to see what the weather is like in Iowa at Parks Library Preservation.